Far too many of us see no harm in leaving our car in idle as we run back into the house real quick, but if a criminal sees it they will find it impossible to deter their eyes. 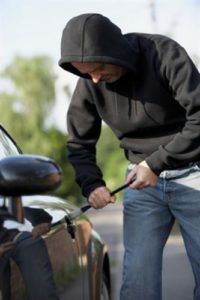 Likewise, leaving your car unlocked can make you extremely vulnerable to car theft. Since we depend on our clickers to lock our cars, many of us forget to glance and double check before leaving our cars unattended for hours. Make an effort to double check that your car is locking with the click of the button. Whenever valuables are left in plain sight, your car is extremely susceptible to car theft. Keep your belongings and car safe by tucking away any valuables and never leaving new purchases out in plain sight. Most importantly, be proactive. Do not park in dangerous, dark areas and try to keep your car free of your personal belongings.